The biggest winner coming out of this year's North Carolina legislative session is probably Governor Bev Perdue. In March she had a 30% approval rating and trailed 2008 opponent Pat McCrory by 14 points in a hypothetical rematch. Now as the popularity of Republicans in the state has cratered her approval is up to 36%, the best it's been in more than 2 years, and her deficit against McCrory is down to just 6 points. Perdue is still in a very, very difficult position for reelection. But I would have pegged her chances at a second term below 20% three months ago and while I still think she's at less than 50/50 the odds have improved greatly. Perdue trails McCrory now 45-39. Her biggest issue continues to be her base- while McCrory is winning 82% of the Republican vote, Perdue is getting only 65% of the Democratic vote. Perdue is also losing independents by 12 points but she could still get reelected with that kind of deficit if she was winning 80% of the Democratic vote. The thing to watch for Perdue over the next 17 months is her black support. Right now she trails McCrory by 23 points with white voters. That's pretty much identical to her 22% loss with them in 2008. What has her in such a difficult position is that she's up only 61-15 with black voters, compared to her 90-9 victory with them last time around. If she was winning African Americans right now by the same margin as the first time she would be leading McCrory by 1 point. Democrats do almost always win 90% or more of the black vote but for whatever reason Perdue does have a persistent weakness with that group of voters. If she can overcome it her chances for reelection will get a lot better. The other interesting trend we're seeing right now is a weakening in McCrory's favorability numbers. 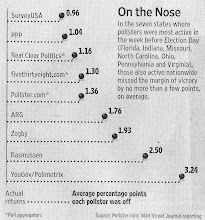 When we did our first 2012 Governor poll last November he was at a +14 spread (34/20). Now he's down 13 points to only +1 at 30/29. There hasn't been any change in his standing with Republicans over that period of time. But he's lost a great deal of his crossover appeal to Democrats, going from almost break even (24/27) to very unpopular (16/44) across party lines over the last 7 months. And although he's still on positive ground with independents his numbers are down with them as well from +16 (34/18) in November to now +4 (30/26). McCrory has pretty fully embraced the new Republican legislative majority even as independents have turned sharply against it and Democrats have been reenergized by it, and he's paying a political price for that embrace with declining poll numbers. McCrory's probably still the favorite next year but his election as Governor is looking a lot less inevitable than it did at the start of the year. Perdue will defeat McCrory again ending his worthless political career. She will add her name to the list of Terry Sanford and Jim Hunt as one of NC's greatest governor's and promoters of public education.